“It's hard not to stare at that twig sculptural piece on the side table, even if you don't have a hole phobia. 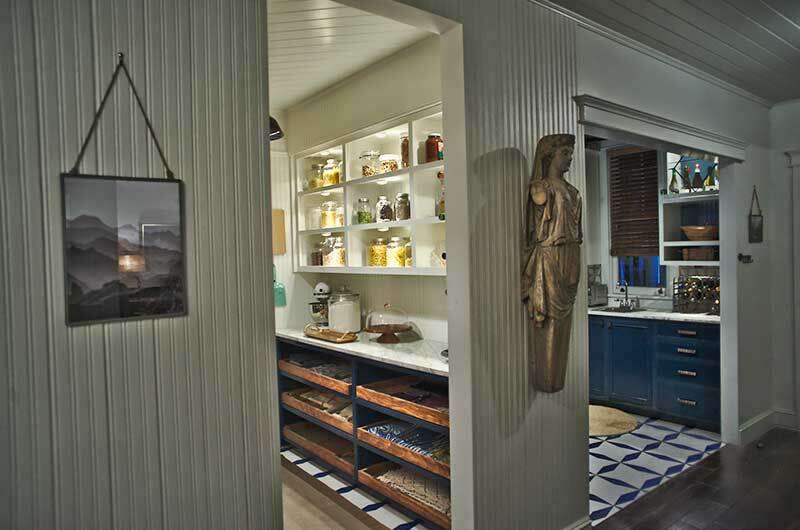 “The kitchen pass through is Claire's nod the chef of the house, and her professional life. “Threatening arms on the foreground chair are a nice accent to the alarming diptych artwork from Art Pic. “Another ominous light fixture looms above dizzying texture in the master bath. It's all practical plumbing, on a real second floor set onstage. 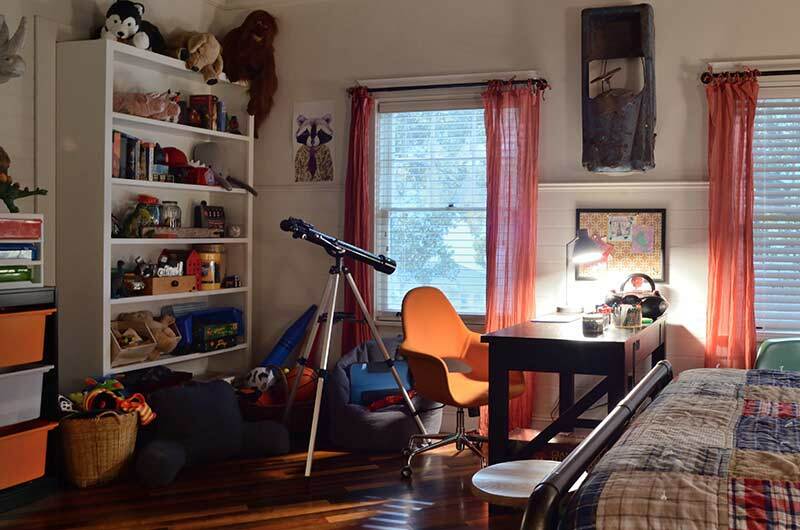 “This is a nice high end kid's room at first glance. “...A kind of retro cocoon where Kai hatches his plans. 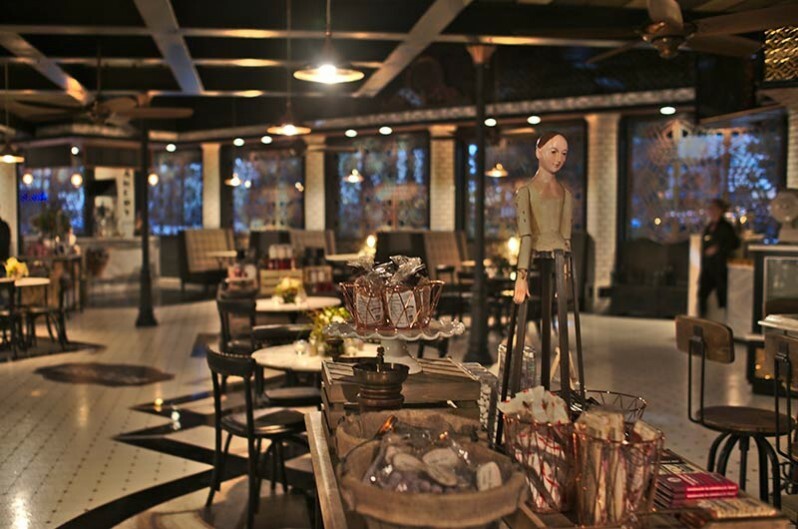 “Ally & Ivy's place of business carries the design theme onward. It's all quite elegant, but again, it's also unsettling. “That figurine seems to know you're checking out the goods. You might draw back a bloody nub if you get too close. 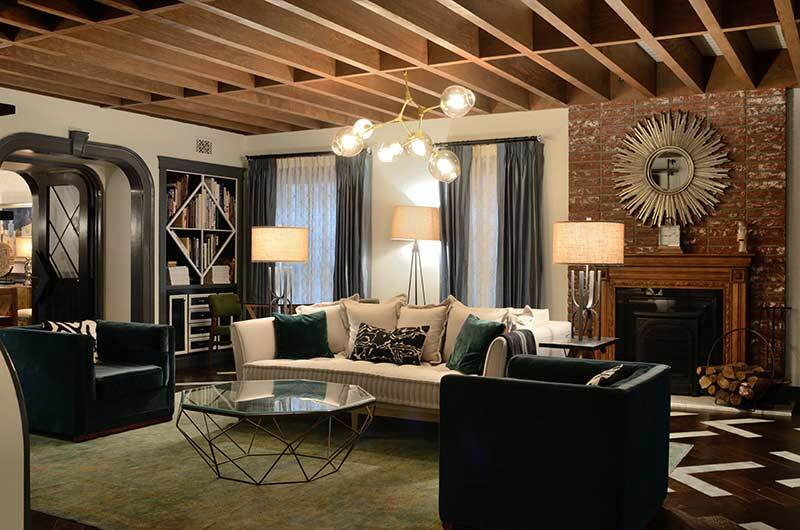 We asked Emmy-winning Set Decorator Jason Howard SDSA to give us his perspective on the distinctive stylized edginess of the set decoration by Claire Kaufman SDSA for this season’s manifestation of AHS. These two set decorators have rocker souls mixed with total style and class...and they share a delight in interweaving quirkiness and surprise and the unique. The first thing that strikes you about the Mayfair-Richards house, on a stage at Fox Studios is the scale. Then you see the finishes. Then the patterns hit you. And it all can make your head spin a little. Claire Kaufman SDSA has taken on this year's installment in the FX Anthology series AMERICAN HORROR STORY. The story springs off of the past presidential election and filters through a married couple, Ally and Ivy Mayfair-Richards, who also own a business together. Ally has multiple phobias which often require the services of her psychiatrist, whose evil brother Kai forms a violent political cult...thus the significance of the subtitle. Like previous seasons, the story has an air of menace, fear, and something not quite right in the air. I think anyone walking into the set can get that something is amiss. It's stunningly executed. There is no doubt about that. What Claire and Production Designer Jeffrey Mossa have created is a world that feels a little bit oppressive and off balance emotionally. In less skilled hands, it wouldn't be so beautiful to look at. 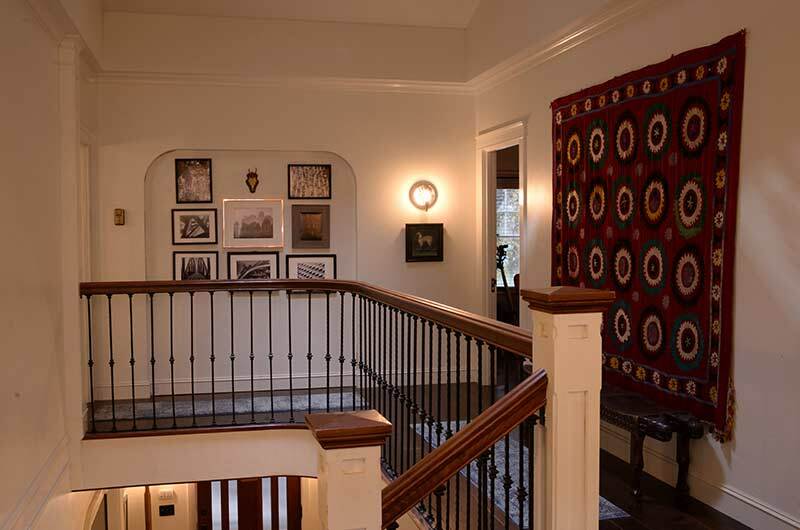 Throughout the house there are repeated geometric patterns. 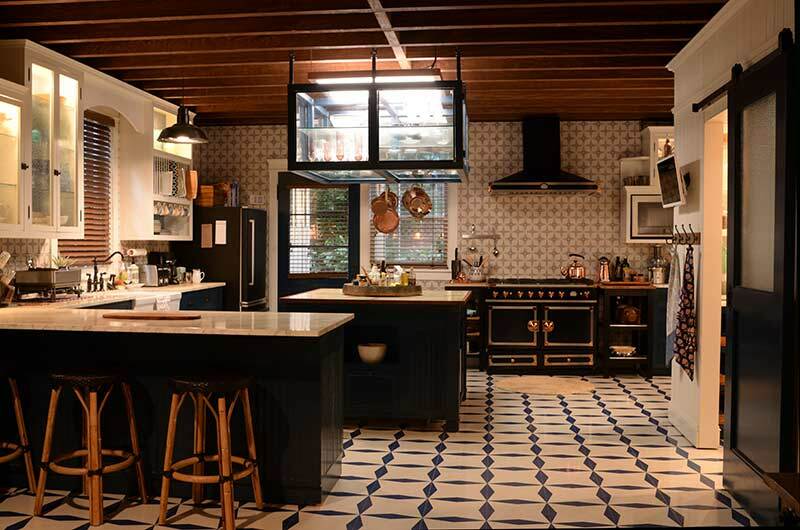 The flooring in the kitchen is at first glance reminiscent of diamonds and daggers. 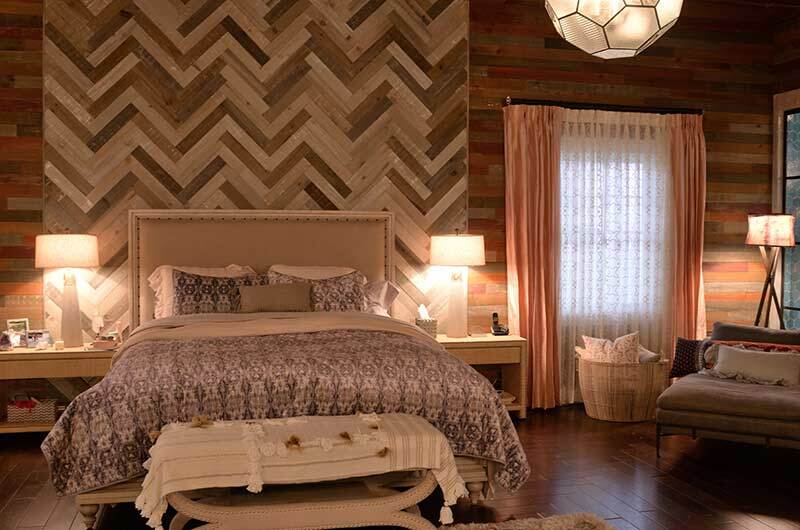 The interlocking wood chevron backing above the bed is a hypnotic but sharply over scale piece that looms rather than comforts. 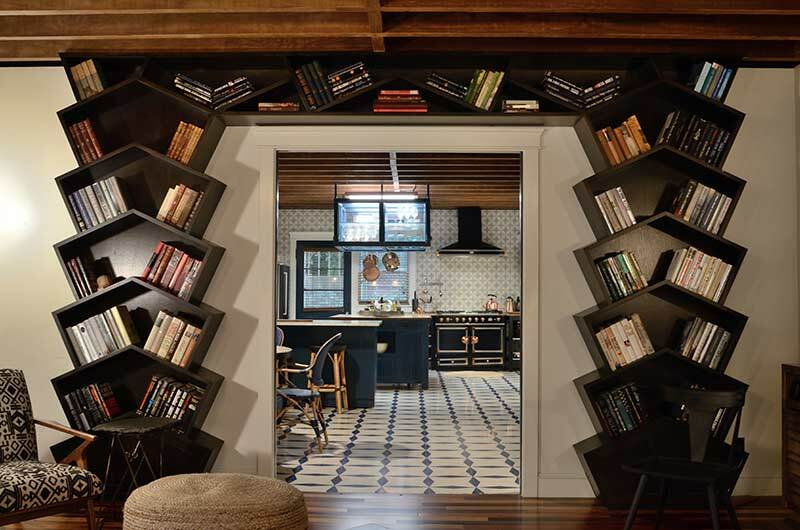 The living room sports a massive stacked ziggurat type bookcase that frames an oversized doorway. The dark wood and angles cast odd shadows and it truly looks as if it may have sprouted out of the floor in a rush of movement...a jagged tumor that exploded from beneath the floorboards. It is kind of the statement piece to end all statement pieces. It all sounds a little over the top, but it doesn't strike the viewer at first pass. It only all seems to be a subtle patchwork of psychological unease after one thinks about it. And if you stare at the photos of some of these elements too long, they can give you vertigo. I asked Claire if that was the plan all along. "Absolutely," she quickly answers. I know Claire, so I'm not surprised. This couldn't possibly be accidental. One particularly compelling piece is a crosscut profile of stacked branches. It could be corks. It could be wood. It reminds one of a honeycomb. It's one of Claire's favorite pieces, and was chosen specifically to refer to one of Ally's many phobias - holes. It's indicative of what's happening all over the elaborate 2 -story set. The organic mixed with the glossy and slick. That's a hard combination to blend well, but the tapestry of these disparate materials really works. There is a lot of sharpness all over the place. Square shapes are turned on their sides and play more like diamonds. The arrangement and breakup of such shapes lends itself to many triangles scattered throughout the residence, in both metal and wood. The sharp plays next to warmer colors and textures. The storytelling of these choices is apt - there is danger threaded throughout this lovely environment. It's as built in as Ally's growing mental problems. Again I wonder, is this a coincidence? Claire responds, "Of course not! There are myriad hidden messages in the house that play on Ally's phobias." The flooring in this set presents one thrill after another. As do the walls. 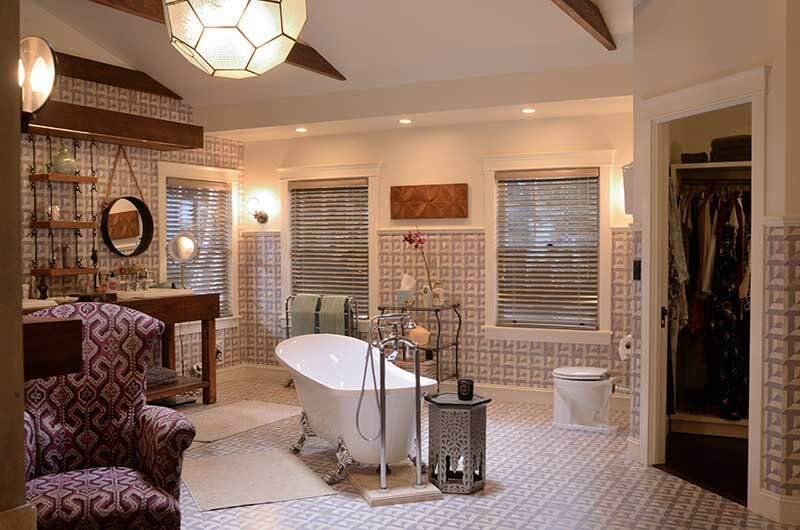 Repeated large patterns on the bathroom walls and floor are the same material. Lovely, but oddly hypnotic if you look too long. Claire cleverly adds a number of more subtle repeats of these lines in fabric choices. 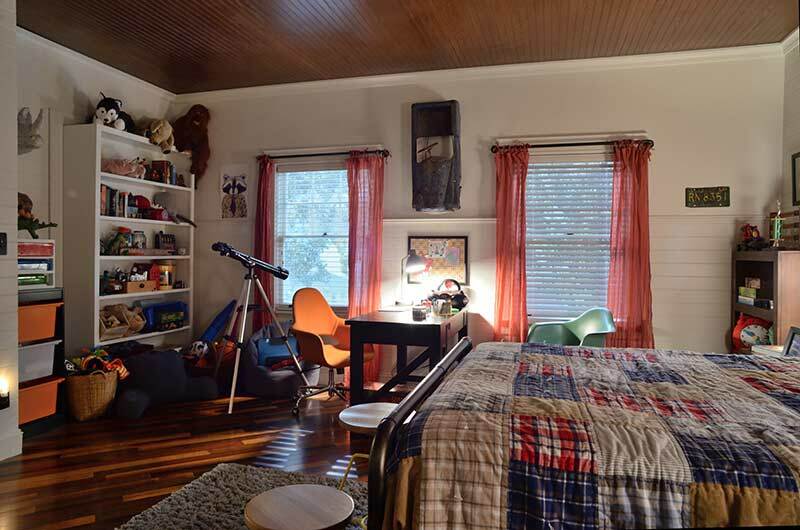 Even the room of the couple's young son Oz has an arresting flooring choice. Richly stained contrasting hardwood is unexpectedly laid on the bias. It upends the entire harmless looking room. Another favorite element of Claire's, she vows to repeat it in a home should she get the chance. Much of the artwork in the house was acquired at Mary Kornowski Gallery, a trusty vendor Claire has used for years, and Art Pic, always cutting edge. There isn't a throwaway piece in there. Again, there is stark contrast and a high level of drama in much of the art. 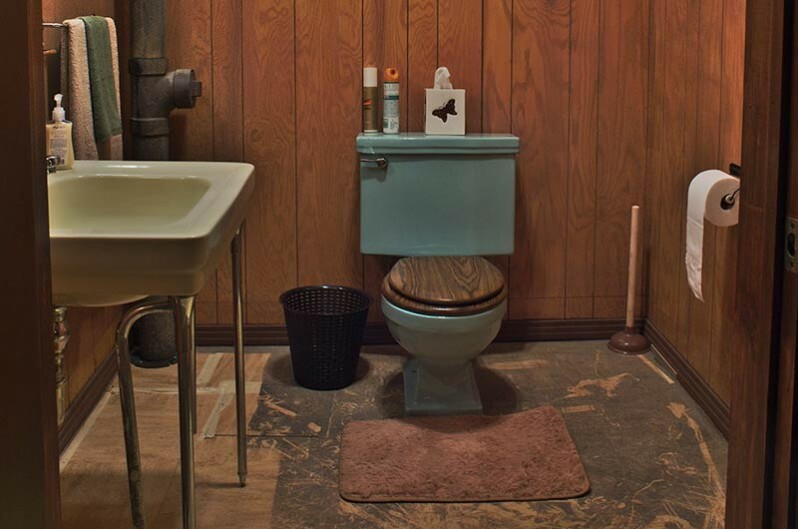 Bold choices make up much of this environment and they embody a feel that is both homey and startling. The rich fabrics and textures create an elegant overlay to the geometry. Claire hoots out a rich laugh when I bring this up, "That house is so in my wheelhouse!" 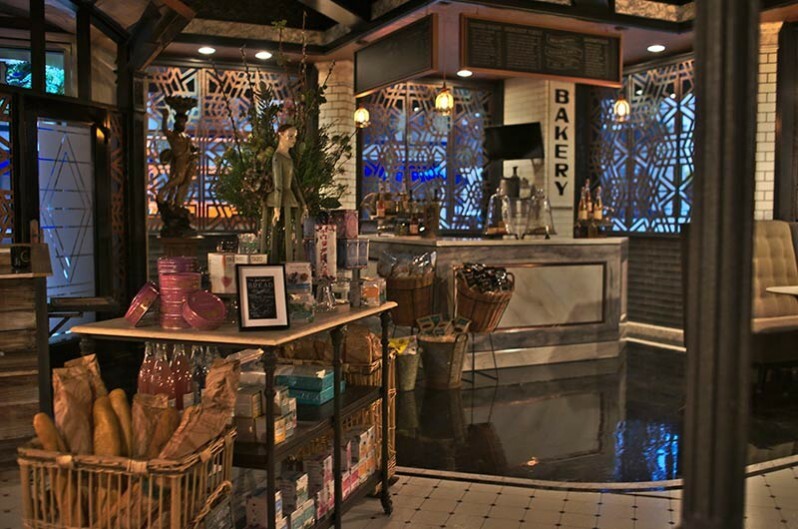 The Butchery on Main, Ally and Ivy's place of business, carries this design theme onward. A mixture of glossy surfaces is broken up between subway tile, marble floors, black and white palette, and an intoxicating mix of leather and wood. Accenting pieces of hammered copper jump out. 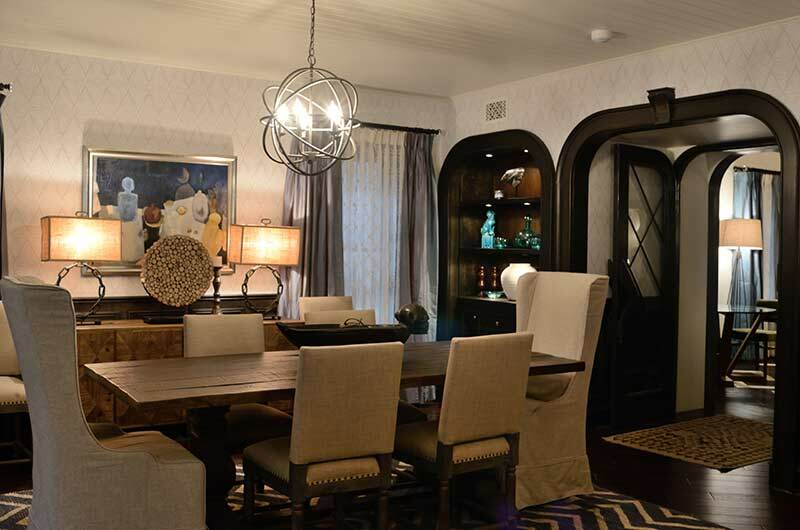 The entire space is hemmed in by windows covered with deco inspired cutouts that serve to give the feel of a prison. It's all quite elegant, but again, it's also unsettling. The product tables feature Voluspa, a favorite of Claire's. Fresh flowers come weekly from My Secret Garden. One of the standout moments of the set is a fan-like grouping of 3 overscale copper sconces. They were sourced from Universal Property and play as a single piece. I couldn't take my eyes off of them. Shimmery details offer a great finish to the set - the glistening fake food is top notch, sourced through Lennie Marvin's Prop Heaven. The freshly painted sides of beef in the cold storage room were found at Warner Bros. Property. And of course, like the plumbing fixtures in the house, the meat cutter works. There are live flames. These are crucial touches for Claire as well as the production team. The action demands a working set. 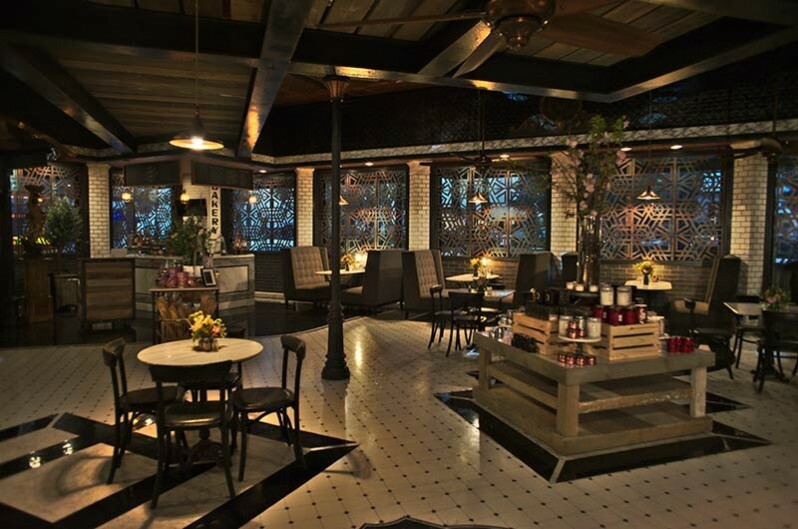 And walking through the environment one can imagine it buzzing with activity and food being served. Right down to the blood-spattered walls in the meat cutting room, the details are on the mark. Knowing AHS, it isn't a stretch to suspect some of the blood might be of the human variety. Oddly, this set was Claire's biggest challenge...sourcing the dressing for a butcher isn't second nature, much research was required. But you'd never know it looking at the finished product, and that's a sign of great work. 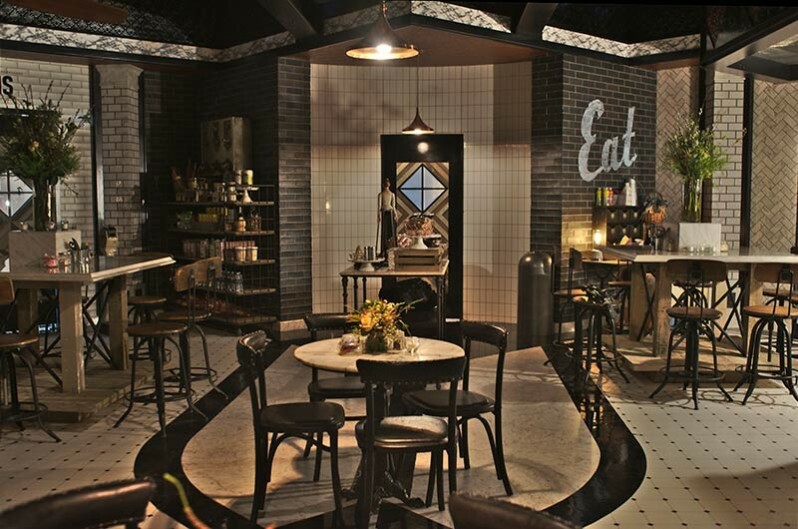 The sets aren't all gloss and bold design. Human elements lend warmth to Kai's basement lair. Bronzed baby shoes sit on a shelf - one assumes they are childhood relics of Kai and Winter (played by AHS alum Evan Peters and franchise newcomer Billie Lourd, respectively). 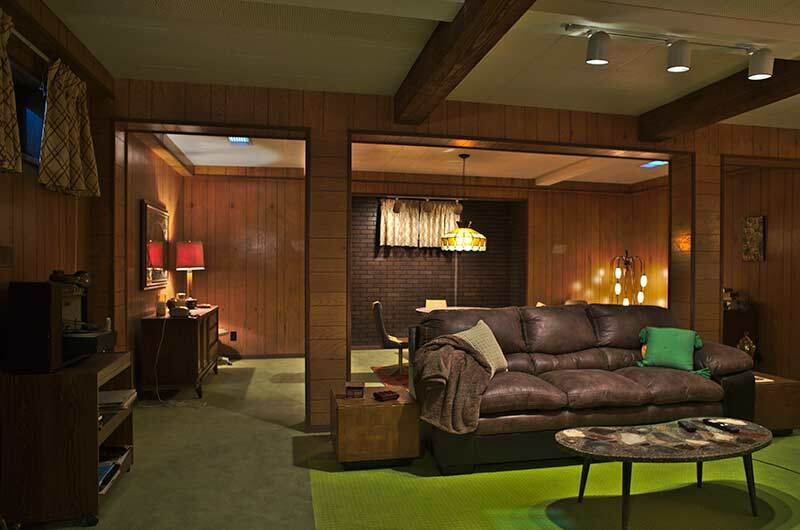 The basement is a warm cluster of ‘70s wood tones and earthy fabrics. 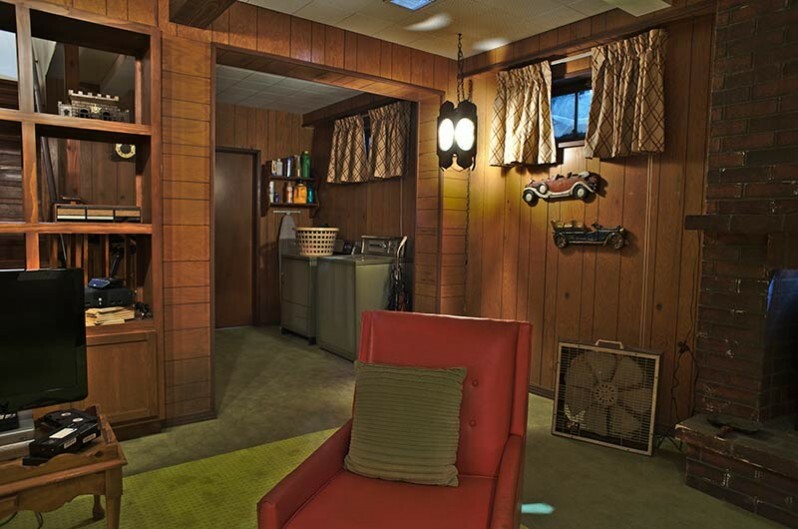 A kind of retro cocoon where Kai hatches his plans, it's the kind of room everyone of a certain age has been in—classic ‘70s suburban cool man cave. And yes, there's period stereo equipment. A running gag exists in a fantastically geeky grade school photo of Claire's ex-husband Rick. She's used the same photo in many sets over the years. Ally and Ivy's house, too, has a few of these personal Claire touches. Some of her clothes hang in Ally's closet. 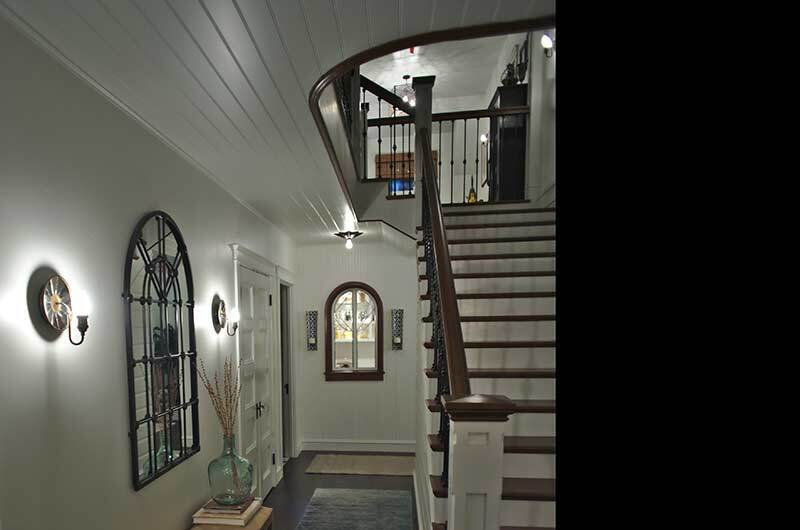 The upstairs landing features a large red wall hanging that she grabbed from home. "I had this big blank spot on the wall, and just happened to have the perfect thing at my house," she says with a laugh. 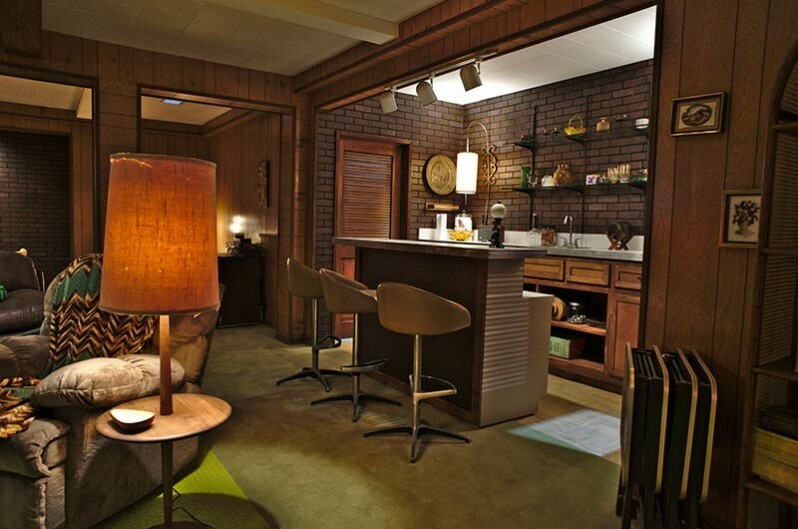 It's something most Set Decorators have done at one time or another. Also like many of us, Claire tends toward more layered sets. These permanent sets are actually scaled back. There was another layer on top of the finished product that was stripped away. 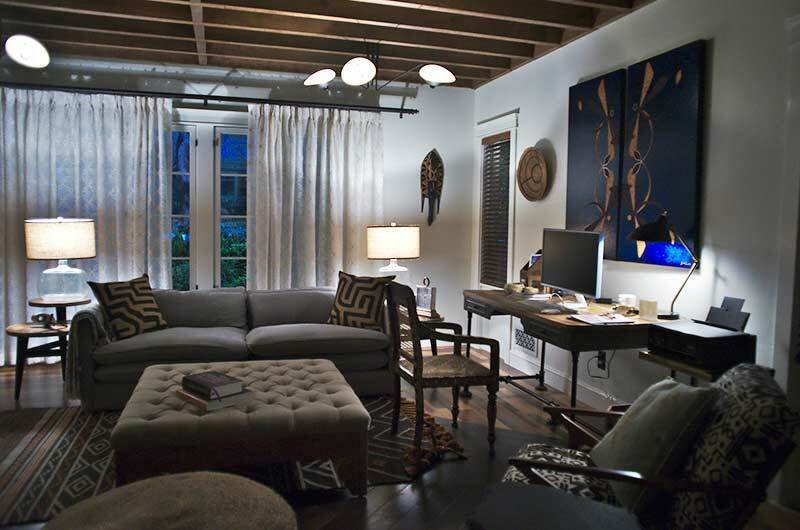 She knew going in that Executive Producer and Co-Creator Ryan Murphy prefers a sparse style of decorating but as she quips, "It's always easier to take away than add." I ask her about pulling that extra layer out and she sees it as a learning experience, "The house already has so many lines and details, I'm glad it worked out that way." Any viewer with a good eye is glad too, as it's all quite stunning to look at. It's that voice of experience that helps take the work here to the next level, and when you add the know-how to Claire's obvious flair for rich textures and drama, you get a compelling result. The show is full of twists and turns and shocks, as AHS always is. But you can truly just watch it for the sets. The more you look, the more you will see.